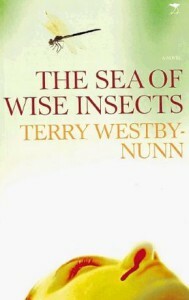 The Sea of Wise Insects by Terry Westby-Nunn is a novel unlike any I recall having read. Gratefully, it came to my attention by way of one of my favorite fellow bloggers, Alison, who resides in South Africa (despatchesfromtimbuktu.wordpress.com). It was also my good fortune that a local university had a copy of the book. This is a novel within a novel; a story about a 30-year-old woman named Alice living in South Africa who has recently been charged with culpable homicide for driving a motor vehicle which was in an accident causing the death of one of its occupants. Alice is a vividly written, accident prone woman who has multiple scars, a missing finger, and a loveless existence. To top off her story, there is another story being told in this novel. Interspersed is the recently published novel of Alice’s former lover of two years who left her without a word a few months prior to the fateful automobile accident. The secondary novel is a fictionalized version of the relationship Alice had with her former fiancée. It seems the former boyfriend was using Alice as food for a character in his fictional novel. As Alice reads the book, we as readers are given the dual perspectives of the people in a failed relationship. This entry was posted in Uncategorized and tagged Books, England, fiction, Insects, South Africa, Terry Westby-Nunn, The Sea of Wise Insects. Bookmark the permalink. Thank you for your comments. They are greatly appreciated. After exploring a few of the blog articles on your blog, I really like your way of writing a blog. soon. Please visit my website too and let me know how you feel. Appreciate your kind comments and thank you for them.